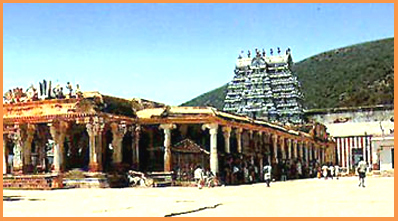 It has eighteen sacred places, the more famous ones being Tirukkurungudi, Tirumalirumsolai and Tirukkottiyur. Tirumalisai alvar (one of the early alvars from Tondaimandalam) visited Tirukkurungudi and Tirukkotiyur but not Tirumalirumsolai probably because the last named had not become prominent in his days. Nor did Kulasekhara visit the shirne.¹ But it has been visited by the later alvars (four). It will also be noticed from the chart that except in tyhe case of Triumalirumsolai and Tirukkurungudi the shrines which were visited by Sri Nammalvar were omitted by Sri Periya Alvar and Sri Andal. Apart from the circumstance that the two alvars belonged to different castes there may have been some other reason also for his noticeable attitude. There is also the fact that they did not visit the place by a vist the place of birth of each other as they seem to have been contemporaries. If they were not contemporaries we would except the one who was born later to honour the older's birth place by a vist. The Deities in their birth places (Alvar Tirunagari and Srivilliputtur) were not visited or sung by any other alvars excepting themselves. This leads to the suspicion that the greatness of Sri Nammalvar and Sri Periya Alvar was recognised only after their death and perhaps due to the publicity given by Sri Nathamuni and some of the later acharyas.